if you are interested in the website itself, please make yourself known and we will figure it out! In every label collector there must somehow lurk a masochist. What other reason could there be to spend strenuously earned money on, say, New Look At Latin by Los Escudos, except the fact that this is Deram DML 1003, and thus indispensible for Deram collectors? Luckily there is another side to this as well: label collectors can be agreeably surprised by acquiring a record they wouldn't have dreamed about purchasing otherwise, but which turns out to be musically satisfying or even better than that. In the late sixties and early seventies almost every large record company set out to initiate a subsidiary label (or more than one) that aimed to seriously consider rock as a form of art, and by doing so offering the public ''quality'' through elaborate and artful packaging, as well as opting for more adventurous musical contents. The teeth of time often gnawed away at this concept pretty roughly, but it cannot be denied that some releases born under this new sun hold their ground as of yet. Which labels are the collectible ones is determined by a broad spectrum of reasons - too many to dive into here and now. There is little doubt, however, that the Vertigo swirl label is one of rock's most collectible labels. 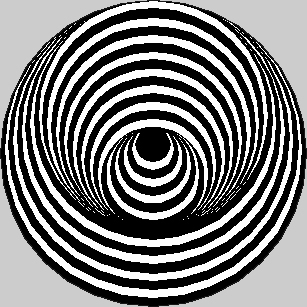 Vertigo may be considered as the Blue Note of rock. We are compiling all Vertigo swirl releases from the inauguration of the label until the final straws in the late seventies and even early eighties. We do NOT compile any releases on the label (like those of Soft Cell or Metallica) that were issued AFTER the initial gap!! Nor do we compile releases that had a later label design, even though the Vertigo logo may be used somewhere on the new label or on the cover. Also: we do not list any reissues. As the Vertigo swirl label was treated differently in many countries, we found the best way to structure the information was to divide it by country. England (or perhaps we should say Britain) was the country where the label first saw the light of day, and so we will handle the British releases first. In the British department you will find most of the general information that we could retrieve. Of course, these are the most collectible anyway. Aspects which we will consider are the music itself (but concisely), the packaging (cover and inner sleeve, art-work, label design etc. ), the disc (matrix numbers and the like), the rarity, but NOT the value on the collector's market, as this is fluctuating too much for comfort. The rarity-scale will be the usual one from COMMON (nowadays only very few, if any), through SC (scarce) and further getting ever rarer from R1 to R5, this last meaning extremely rare and yes, we mean extremely rare. You will probably have noticed that rarity and collector's cash or trade value do not necessarily match. A record can appear several times a month on many platforms and still command a high price, although it's obviously not very rare. Rarity scale indications are always for complete copies, that is with all posters, inserts and other paraphernalia intact and present. The split-up by country will give you the opportunity to compare similar releases in different countries, as well as show you some releases you most likely have never seen. You thought that 6360 035, 6360 047 and 6360 061 were not released? We will prove you wrong! This is a non-commercial site, aimed strictly at the discerning collector. You will find no advertising here, nor do we in any manner change anything on your computer. We send you no cookies, no malware, no data-miners, no anything; there is no password, no log-in, no counters, no tracking and of course the site is free to use. We do not store any information from your computer in any way. To Peter Eklund from Sweden, who provided us with 22 pictures of Black Sabbath sleeves and corrected some mistakes in our Sabbath discography! And to Morten Birkeland Nielsen from Norway for pointing out several very helpful sites and persons and also providing some nice single scans and an Argentinian album too and several, no, countless (we have lost count, indeed!) more contributions! He just did it again!! And to Erik Smedsvig from Norway, who found a hitherto unknown swirl inner sleeve from Germany and contributed with more single scans! And to Sergey Batalin from Russia for a great label picture (Black Sabbath again)! And to John Buck (from South Africa? ), who pointed out yet another Black Sabbath cover! And to Deepinder Cheema from good ol' England who shed light on the origins of the swirl design and also provided us with with scans and additional information! And to Adam Kaufmann from Switzerland who provided additional information concerning the Swiss release of 6360 011! And to Michel Veenstra from The Netherlands who sent us additional information on Dutch releases! And to Kim Hjerppe from Finland who provided us with some missing matrix numbers! And to Jukka Vihunen from Finland who explained the last few digits of the matrix numbers to us! And to Ken Thornton from the USA who added invaluable info on Patto! And to Martin Daughton from the UK who intensively updated the singles sections, not once but several times! And to Chris Davies from Wales who sent us an avalanche of great scans and additional information too! And to Bjørn Luka from Norway who sent us a missing single scan! And to Pär Pålsson from Sweden who provided a missing label scan to our great pleasure! And to Aalbert Rebergen from New Zealand who sent great additional information on releases from that country! And to Davy Mattheeussen from Belgium who pointed out a grave omission! And to Mathew Villain from The Netherlands who provided additional info (and scans too) on Black Sabbath singles! And to Håvar Eide from Norway who added some variations on a Quo album and quite a lot of other details too (to put it mildly)! And to Richard Morton Jack (UK?) for an interesting suggestion on a 'lost' album! And to Julian Thomas from the USA who taught us the meaning of some Japanese characters! And to Martin Green from South Africa who did just the same! And to Serge Bellerose from Canada who sent info on Canadian releases. And to Jean Jöbses from the Netherlands who provided great scans of a missing album! And to Paolo Chiorino from Italy who send us three missing single releases! And to Todd Dalessandro all the way from Connecticut who severely updated the Mexican department! And to Swa Verhoeven from Belgium with an obscure release from that country! And to Roger Trenwith from the UK for an unknown release from India and additional matrix number information! And to Jan van Zeeland from The Netherlands for an update of the US singles department and quite a lot of other suggestions too! And to Paul Allen from the UK for pointing out two different variations of a British cover and a counterfeit release as well! And to Brian Ashworth from the UK for pointing out another set of variations on a cover and offering a scan of this! And to Miguel Angel Salazar Canuto from Mexico for an intensive addition to the Mexican releases. And to John Stannard from the UK for additional info on his very own Tudor Lodge! And to Virginia Scott from the UK for additional info on her very own Beggar's Opera! And to Graham and Tracie Kidd from the UK for an addition to the Singapore page! And to Jan Andersson from Sweden for a hitherto unspotted Italian single and a Guatemala album and many more, too much to list, actually! And to Uli Klatte from Germany who send cartloads of information as well as a few great scans! And to Michael und Mario Zepke from Germany for adding releases aimed at the Austrian market!. And to Bas Möllenkramer from The Netherlands for explaining 8-track tapes to us, as well as providing several interesting contributions! And to Mauro Malaguti from Italy for severely updating the Italian section and several other contributions, too! And to Mark Lungo from the USA for contributing several corrections! And to Julio Rojas from Chile for sending several missing Chilean single scans and an album too! And to James Anderson from the UK for providing us with strange releases! And to Rainer Thieme from Germany for pointing out a spelling mistake! And to Andy Hibberd from the UK for sending scans of a missing link and a Spanish rarity! And thanks to Luiz Claudio Cals Brügger from Brazil for a useful addition! And to Mauro Degrassi from Italy for more rare scans and information from his country. And to Terje Hultstrand from Norway for adding to the Peru page and some dozens of other things too! And to Augusto Croce from Italy for many (many!) additions to the Italy Page! And to George Prior from the UK for a nice addition! And to Paul Kenney from the UK for an unknown Argentinian release! And to Marcel Hatzky from Germany for another Portuguese release, a strange German release and uncountable other scans, including a nice Australian variation! And to Matthew Reynor from the UK for delivering a missing matrix number! And to Nick Crowe from the UK for a fine extra scan! And to Linda Nicol from the UK for confirming her design of the logo! And to Richard Bosch from The Netherlands for some great additions! And to Marcel Aegerter from Switzerland for confirming a suspicion! And to David Paterson from the UK for explaining inner sleeve numbers! And to Steve Cann from the UK for gently improving our knowledge! And to Vebjørn Lia from Norway for a new Mexican treasure and an avalanche of other scans! And to Klaus Börngen from Germany for missing singles! And to Håkon Busterud from Norway for priceless Norwegian info and an avalanche of great scans! And to Gaetan Breton from Spain for a differing Spanish release! And to Peter Freeman from Australia for invaluable Aussie additions! And to Lasse Henriksen from Norway for a new Argentinian release and more and more! And to Karl Zolles from Austria for a whole bunch of Austrian releases! And to Teddy Hulty from Norway for the missing Japanese LP! And to Karsten Wilkens from Germany for 2 missing singles! And to Gary Painter from the UK for pointing out an error in the matrix number department! And to Jonas Lundqvist from Sweden for adding a true rarity! And to Tommy Dahlén from Sweden for pointing out some double catalogue numbers! And to Steve LaFayette from the UK for finding an amazing country code! And to Brad Laughren from Australia for adding an unknown Australian release and a Columbian rarity! And to Rebecca and Mike from the UK for pointing out a historic perspective on the logo! And to Jónas from Iceland for possibly discovering the lost record numbered VO 5! And to Jaakko Koukkari from Finland for another Singapore release and more! And to Peter Althammer from Germany for adding several releases! And to Frédéric Gigoux from France for another Peru swirl single and info on French singles! And to Andrew Morris from the UK for adding a peerless rarity! And to Lara Asriev from the USA for adding an unknown variation! And to Gildas Quentin from France for a missing single! And to Sasha Krivoshein from Russia for another label variations! And to Claude Malterre from France for yet another lost single! And to Rob Abendanon from South Africa for a hitherto unknown variation from there! And to Ulrich Breitspeicher from Germany for an additional Israeli contribution! And to Frédéric Gigoux from France for sending a complete list with French singles and some more! And to Steve Long from Australia for solving the ''MX"" catalogue numbers from that country! And to Zigzagwanderer from Germany for a better scan than we had! And to Neil Priddey from the UK for pointing out two versions of an album! And to Sven Gusevik from Norway for sending a missing single scan! And to Tomi Behm from Finland for providing a rare Dutch 12''. And to Carl Horrocks from the UK for pointin out an interesting detail! And to Max Demont from Switzerland for adding substantially to that country's discography! And to Jeremy Dunn from Germany for confirming a missing cassette release! And to Noel Somers from the UK for showing a label variation from South Africa! And to Pavel from Switzerland for sending additional Swiss singles and then some! And to Stephan Koenig from Belgium for drawing attention to an exceptional backside! And to Wolfgang Zink from Germany for improving a scan! And to Len Surtees from the UK for additional info on his very own Ben! And to André Illingworth from the USA for another 8 track cartridge! And to Mark Stratford from the UK for clarifying 6360 075! And to Jeff Collins from Canada for finally providing a decent Greek scan! And to Eric Poiradeau from France for another Singapore release! And to Lindsay Marks from New Zealand for contacting us, even though we panned his album! And to Jon Northall from the UK for sending us info on a mispress! And to Thore Engen from Norway for another Israeli release! And to Roger Wake from the UK for rectifying a studio and presenting us with the origin of the title of the second Ian Carr album! And to Tim Bow from Wales for another inner sleeve variation! And to Jin from Japan for clarifying the mysterious Pico and for extra info on the Japanese singles! And to Jan Moonen from The Netherlands for additional releases from over there! And to Landesko Panarama from the USA for adding to a missing line-up! And to Ryan Beale from Australia for information on early releases from Oz! And from Jakob Lernelius from Sweden for filling in on Mexican releases! And to Stein Brekk from Norway for sending a great scan and spotting an error! And to Ben Ortner from Austria for adding a nice detail to that countries discography! And to Jean Bonnefoy from France for pointing out an obvious error! And to Vicente Burguera from Spain for adding a never seen variation! And to Bruce Davis from the USA for a correction and an addition! And to Terry Leonard from the UK for information about VO-231! And to Kobus Roos from South-Africa for sending label scans! And to Andre Krolow from Germany for sending a release we never saw before! And to Sven Envald from Finland for adding a never seen Cressida variation! And to Chris Clark from the UK for pointing out an Italian error! And to James Van Arsdale from the USA for adding a Singapore release! And to Peter Redving from Sweden for pointing out a Dr. Z variation! And to Pedro Alvares from Mexico for adding substantially to that country's discography! And to Peter Churchman from the UK for providing us with yet another acetate! And to Matjaž Kumelj from Slovenia for an unknown Colosseum issue! And to Bruce Roberts from the USA for adding interesting snippets in several departments! And to Steve Philp from the UK for providing us with Uriah Heep content! And to Trevor Perks from the UK for finding a new Singapore release! And to Magnus Oscarsson from Sweden for pointing out a rare mispress! And to Adam Sealey from the UK for enlighten us about Japan's Gypsy Blood! And to Donovan Duguay from Canada for showing a completely unknown Cressida variation! And to Jari Mikkola from Finland for a May Blitz variation! And to João Cucci Neto from Brazil for adding a release from that country! And to Zoran Todorovic from Russia for adding a Cressida single! And to Horst Grimm-Pfaff from Germany for sending a very strange Cressida release! And to Marcel Dreßen from Germany for another Swiss single! And to Gianpaolo from Italy for a missing Spanish album! And to Mads Olofsen from Denmark for another South African label! And to Paolo Calbini from Italy for two missing scans from that country! And to Angelos, Peter & Glenn from Australia for info on the matrix numbers of that country! And to Steve Kelly from England for anothe Singapore release! And to Jon Sandem from Norway for clarifying Scandinavian releases in general! And to Chris Higgins from England for a huge amount of new material that we will process as soon as we can (it's THAT much). A BIG THANKS TO YOU ALL, YOU ARE A GREAT HELP TO GET THIS SITE AS ACCURATE AND COMPLETE AS POSSIBLE!! Best wishes to all of you, thank you for your interest and, how could it be otherwise, happy hunting. 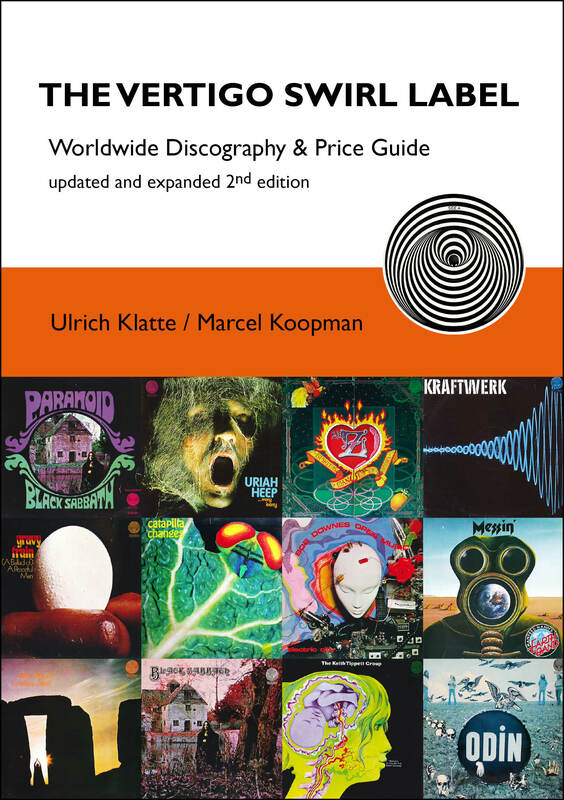 There is now a NEW EDITION of the lavishly illustrated book on the Vertigo swirl label by Ulrich Klatte and Marcel Koopman, which even includes a price guide!